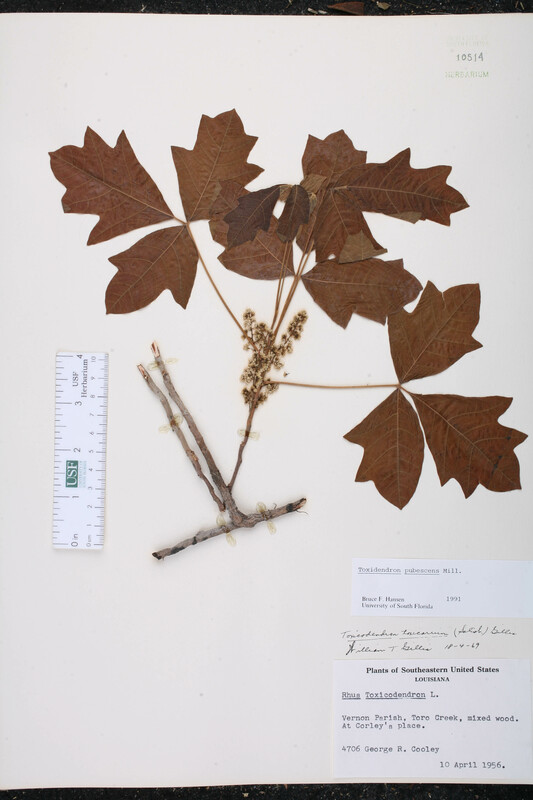 Citation TOXICODENDRON PUBESCENS Miller, Gard. Dict., ed. 8. 1768. Type: Without data, Herb. Sloane 315: 86 (neotype: BM). Neotypified by Reveal, Taxon 40: 334. 1991. Levy F-Lit Lit-F: Gillis, Rhodora 73: 407-408. 1971. Rhus pubescens Rhus pubescens (Miller) Farwell, Rep. (Annual) Commiss. Parks & Boulev. Detroit 11: 73. 1900, non Thunberg 1794, nec Ecklon & Zeyher 1836. 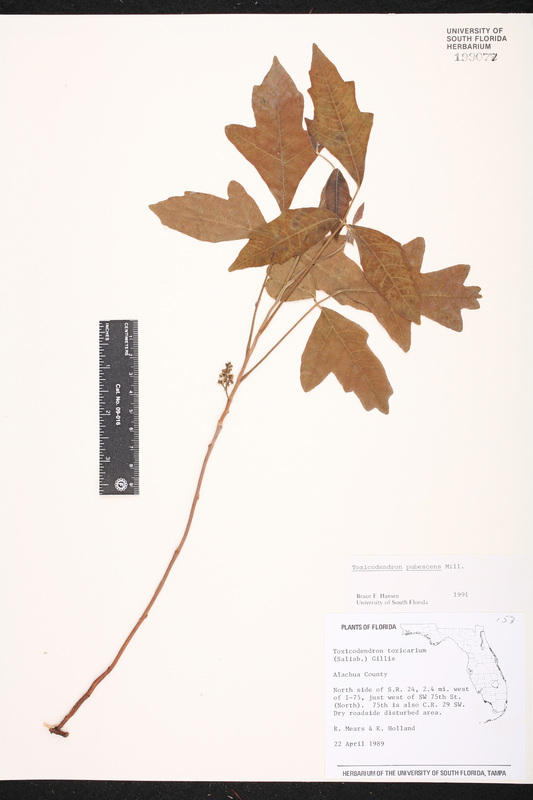 BASIONYM: Toxicodendron pubescens Miller 1768. Rhus quercifolia Rhus quercifolia (Michaux) Steudel ex B. L. Robinson & Fernald, in A. Gray, Manual, ed. 7. 553. 1908, non Goeppert 1855. 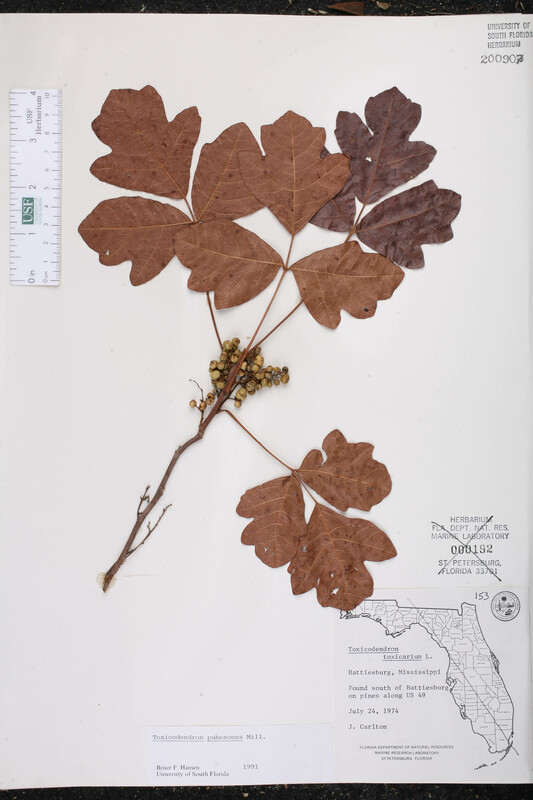 BASIONYM: Rhus toxicodendron Linnaeus, var. quercifolia Michaux 1803. Rhus radicans var. 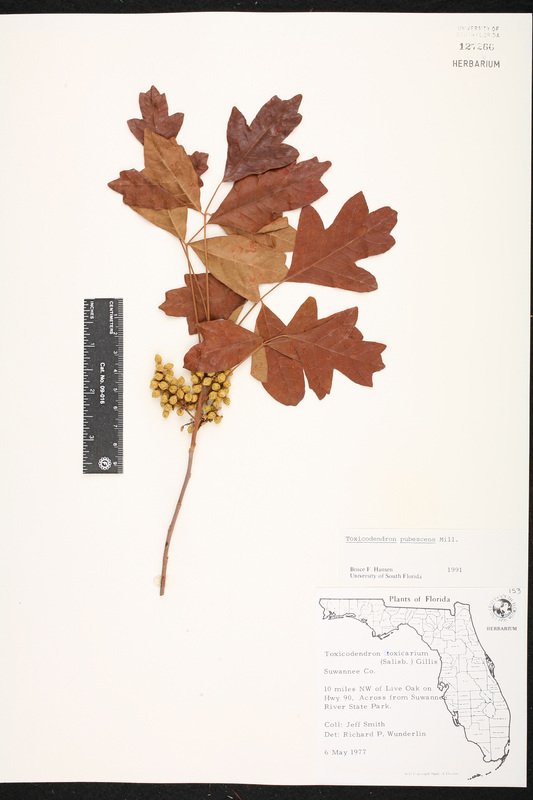 toxicodendron Rhus radicans Linnaeus, var. 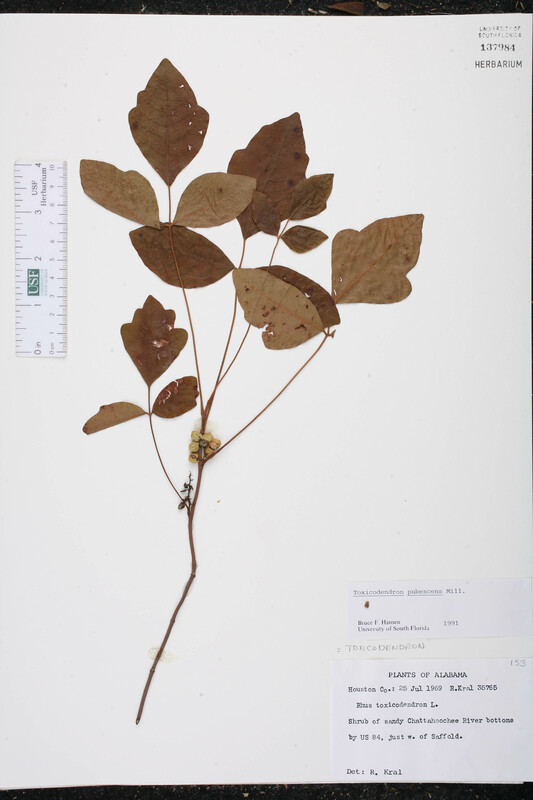 toxicodendron (Linnaeus) Persoon, Syn. Pl. 1: 325. 1805. 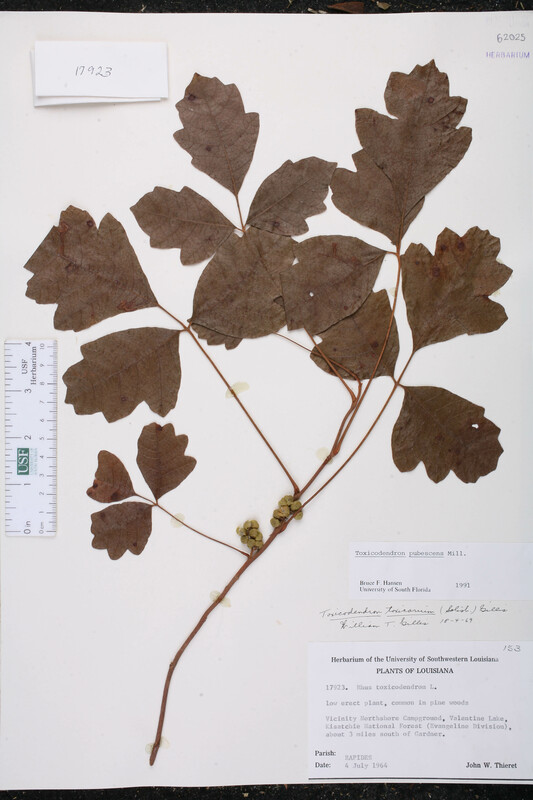 BASIONYM: Rhus toxicodendron Linnaeus 1753. Rhus toxicarium Rhus toxicarium Salisbury, Prodr. Stirp. Chap. Allerton 170. 1796, nom. illegit. 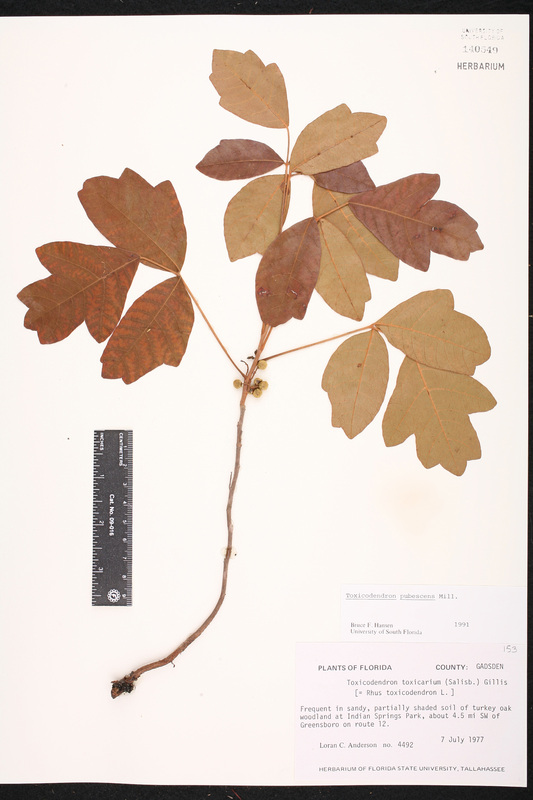 BASIONYM: Rhus toxicodendron Linnaeus 1753. Rhus toxicodendron Rhus toxicodendron Linnaeus, Sp. Pl. 266. 1753. TYPE: Without data (lectotype: LINN 378.16, left). Lectotypified by Fernald, Rhodora 43: 497. 1941; Gillis, Rhodora 73: 402. 1971. 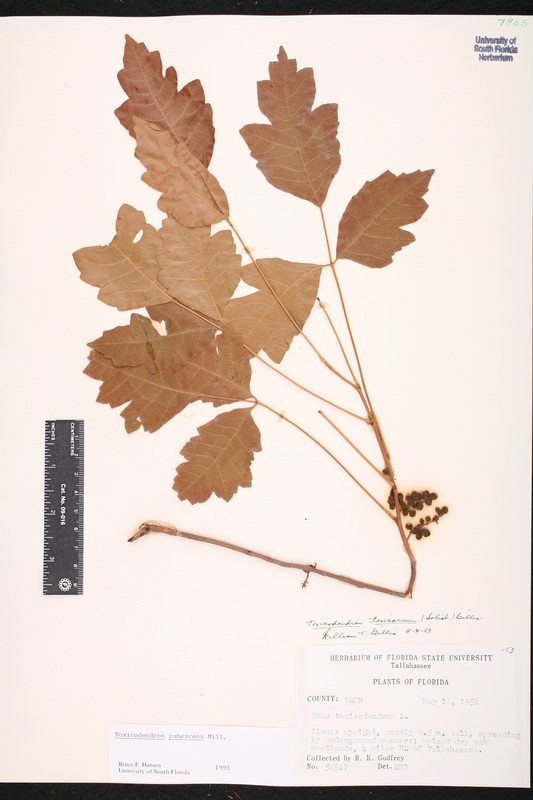 Rhus toxicodendron var. quercifolia Rhus toxicodendron Linnaeus, var. quercifolia Michaux, Fl. Bor.-Amer. 1: 183. 1803. TYPE: Virginie et Carolines, without data, Michaux s.n. (lectotype: P). Lectotypified by Gillis, Rhodora 73: 402. 1971. Toxicodendron quercifolium Toxicodendron quercifolium (Michaux) Greene, Leafl. Bot. Observ. Crit. 1: 127. 1905. 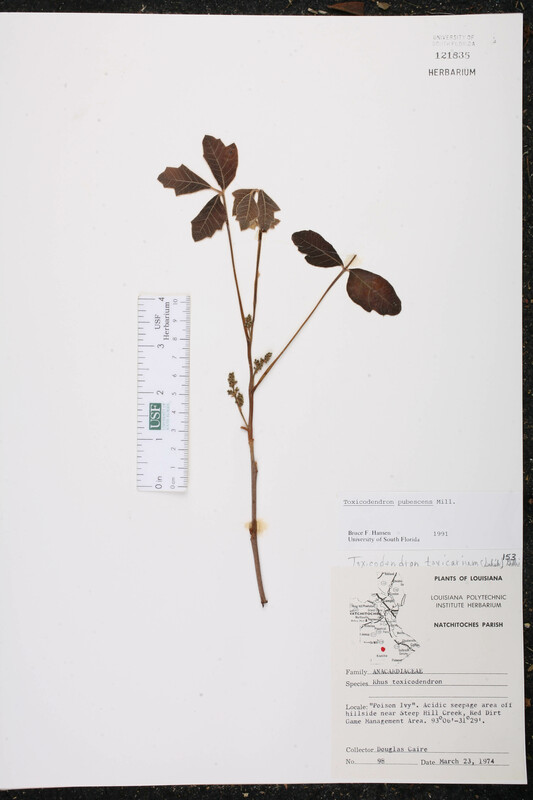 BASIONYM: Rhus toxicodendron Linnaeus, var. 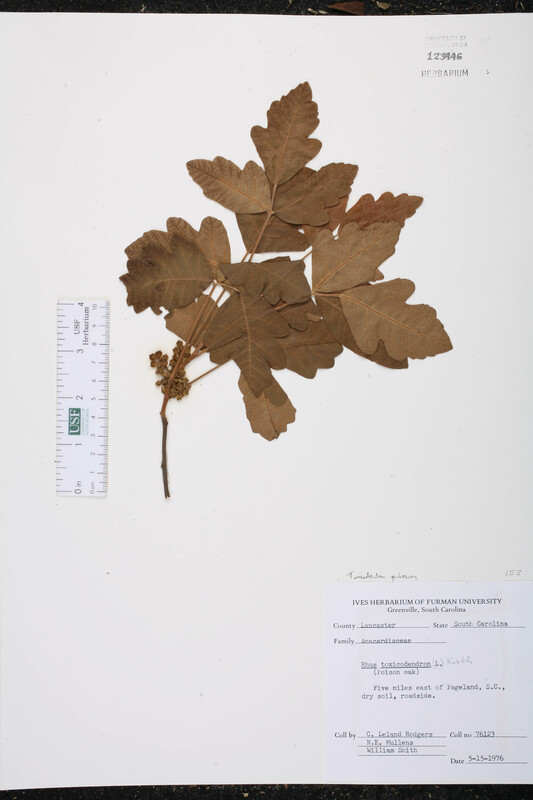 quercifolia Michaux 1803. Toxicodendron toxicarium Toxicodendron toxicarium Gillis, Rhodora 73: 402. 1971. 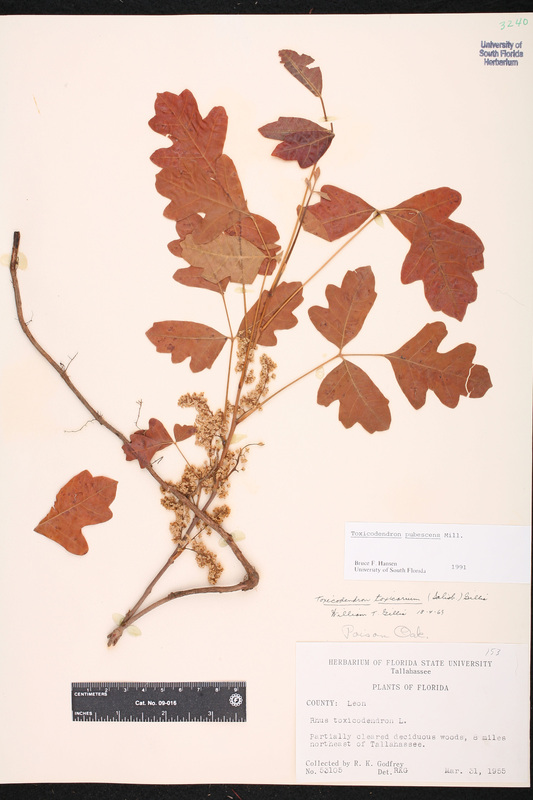 BASIONYM: Rhus toxicarium Salisbury 1796, nom. illegit. ; Rhus toxicodendron Linnaeus 1753. Toxicodendron toxicodendron Toxicodendron toxicodendron (Linnaeus) Britton, in Britton & A. Brown, Ill. Fl. N. U.S., ed. 2. 2: 484. 1913, nom. inadmiss. 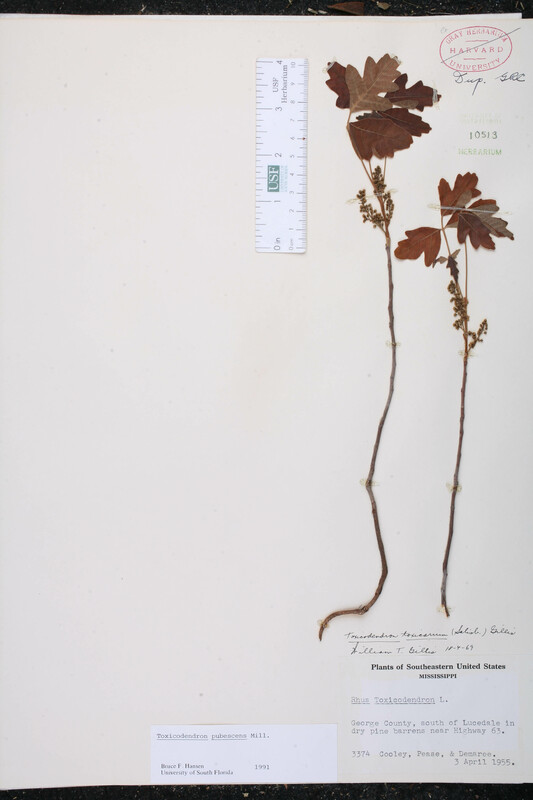 BASIONYM: Rhus toxicodendron Linnaeus 1753. Rhus acutiloba Rhus acutiloba Turczaninow, Bull. Soc. Imp. Naturalistes Moscou 37: 612. 1863. TYPE: TEXAS: Without data, Berlandier 2035 (lectotype: KW; isotypes: G-DC, GH, MO). Rhus toxicodendron forma elobata Rhus toxicodendron Linnaeus, forma elobata Fernald, Rhodora 43: 598. 1941. TYPE: NEW JERSEY: Cumberland Co.: Bridgeton, 1.5 mi. SE by New Jersey Central Railroad, 20 Jul 1909, Van Pelt s.n. (holotype: GH). Rhus toxicodendron forma leiocarpa Rhus toxicodendron Linnaeus, forma leiocarpa Fernald, Rhodora 43: 599. 1941. TYPE: VIRGINIA: Sussex Co.: Near the county line S of Jarratt, 8 Jun 1938, Fernald & Long 8347 (holotype: GH; isotypes: NY, US). Toxicodendron compactum Toxicodendron compactum Greene, Leafl. Bot. OBserv. Crit. 1: 126. 1905. TYPE: VIRGINIA: Carroll Co.: Woodlawn, Aug 1899, Hunter s.n. 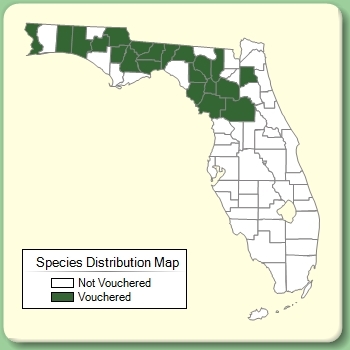 (holotype: US; isotype: GH). Toxicodendron monticola Toxicodendron monticola Greene, Leafl. Bot. OBserv. Crit. 1: 126. 1905. TYPE: GEORGIA: Lookout Mountain, Jul 1898, Ruth 356 (holotype: US; isotypes: MO, NDG, NY). 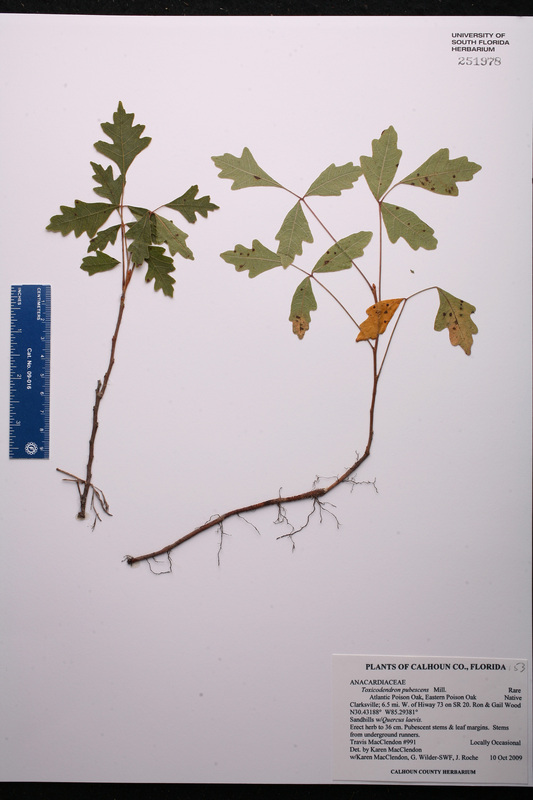 Toxicodendron toxicarium var. 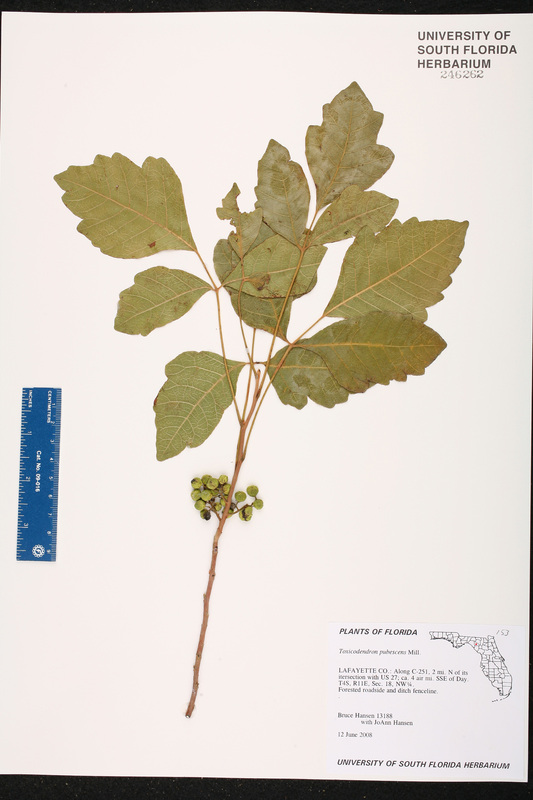 elobatum Toxicodendron toxicarium Gillis, var. 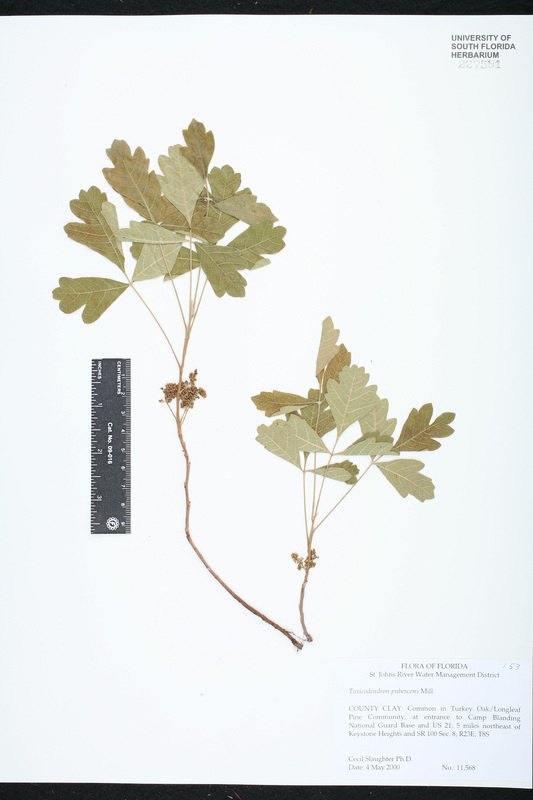 elobatum (Fernald) C. F. Reed, Phytologia 63: 411. 1987. 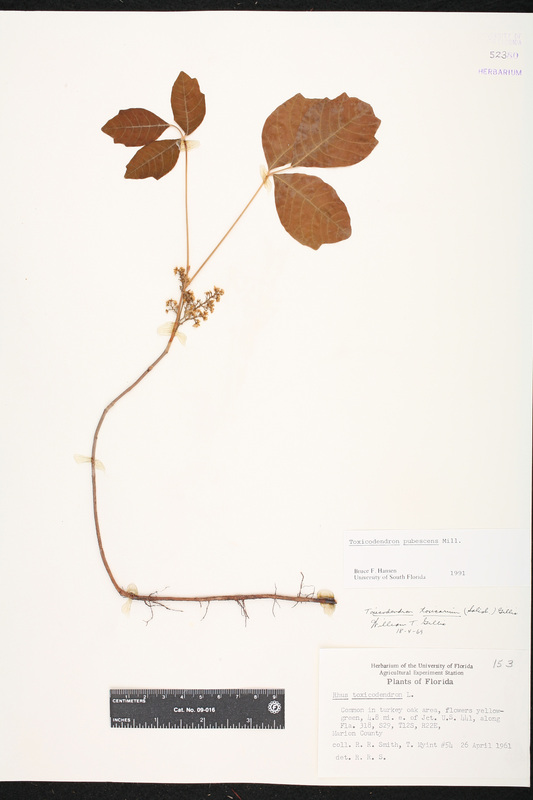 BASIONYM: Rhus toxicodendron Linnaeus, forma elobata Fernald 1941. 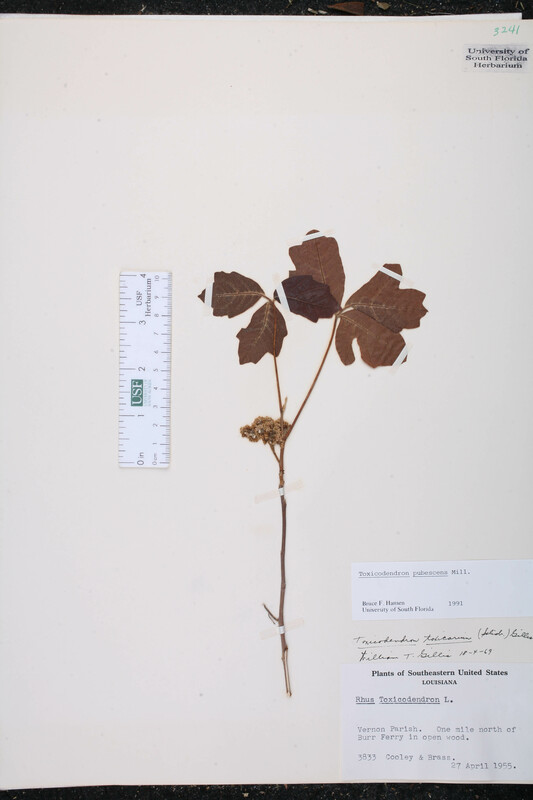 Toxicodendron toxicarium var. 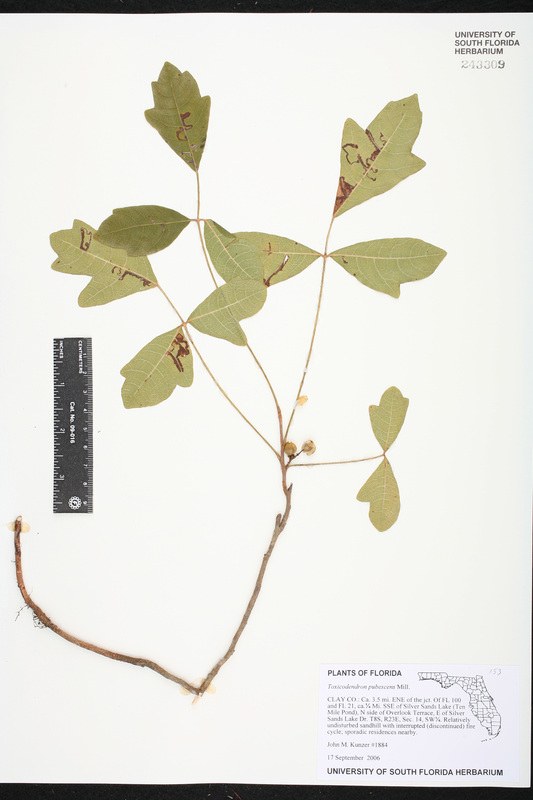 leiocarpum Toxicodendron toxicarium Gillis, var. 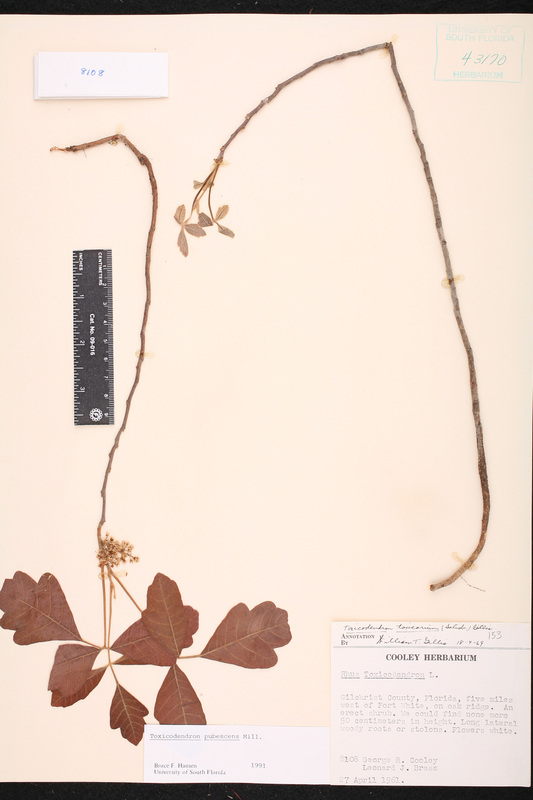 leiocarpum (Fernald) C. F. Reed, Phytologia 63: 411. 1987. 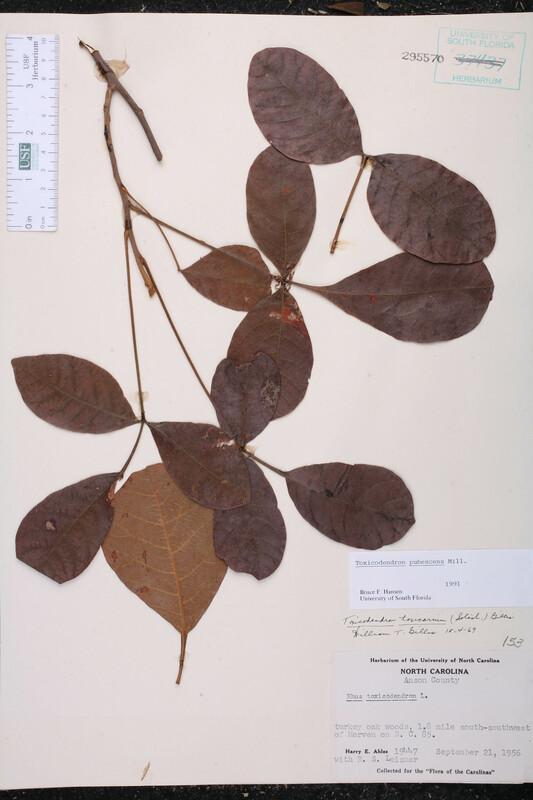 BASIONYM: Rhus toxicodendron Linnaeus, forma leiocarpa Fernald 1941.